Victor Rosado was born in New York City in 1964. He grew up with the radio close to his ear, enjoying the Salsa and Latin music. His grandmas, brothers and mothers parties at his home enhanced his innate sense for the party vibe. Victor stays close to his origins, keeping his soul humble and himself in touch with the real elements of life. Victor's Puerto Rican background and New York City's unique vibe shaped his musical influences. At age 13 Victor spent his allowance on records, and took his 45's along with a portable turntable to the open-air swimming pool in Central Park. Soon after he started playing at parties, weddings and neighbourhood events. Kenny Carpenter took Victor to David Mancuso's Loft party on Prince Street where Victor soon became good friends with David. He would help David organise the Loft parties and the pair would often share and exchange music. Victor began doing the lights at the Loft and was asked once in a while to fill in for David and play records. While playing at the Loft Victor caught the eye / ear of Larry Levan. 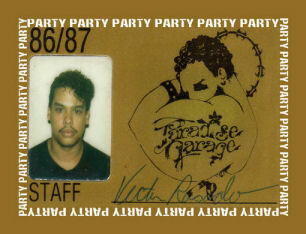 On Victors birthday Larry asked him to play at the Paradise Garage, making a dream of Victors come true. More opportunities came Victors way, and he began playing more clubs like House Nation, Palladium, Studio 54 and Red Zone to mention a few. He got invited to open the now legendary club Yellow in Japan, and charmed the musically open-minded Japanese at the Club Next, Club Gold and The Cave in Tokyo. In London he had the honour of opening the Ministry of Sound.